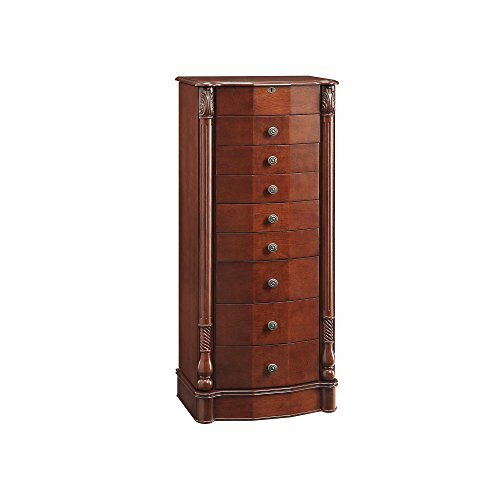 This jewelry armoire has a traditional, elegant design, which finishes with a solid base that provides a great stability to this armoire. Featuring a solid construction, this armoire is an excellent piece which you can add to your room, for adding a plus of style and functionality. Are you ready to bring some elegance and a classic touch to your room? Then you need this Rayford Jewelry Armoire. It is a truly beautiful piece that allows you to easily organize your jewelry and accessories. Besides its functionality, this is also a very beautiful furniture that gives an elegant accent to your room. It is complemented with eight drawers, a top compartment with flip-top mirror, and two side doors with necklace hangers in the interior. The three pull-out drawers at the bottom of this armoire are larger, whilst the five drawers at the top are smaller. The top lid lifts to reveal a hidden compartment, as well as a built-in mirror. This compartment allows you to safely store some of your smaller valuables, such as earrings and rings. This top compartment is also safer that the rest of the armoire, as it is complemented with a lock and a key. The side doors open to reveal two interior compartments, with hooks which you can use to hang your necklaces, but also scarves, ties, or others alike. Hence, they no longer get mixed up or tangled, and it gets easier for you to find everything that you need, without any hassle.